The Bamberg cathedral stands beautifully as a centerpiece over the Dom hill dressed in a combination of Romanesque and Gothic architecture. 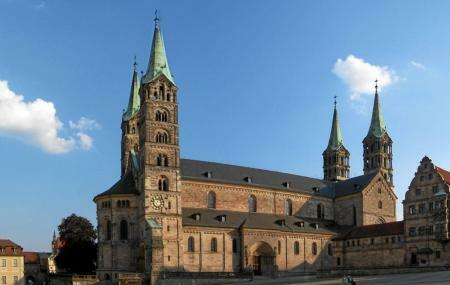 The cathedral has two choirs and is home to various magnificent art works including sculptures from the Hohenstaufen era, the famous statue of the Bamberg Rider, an altar by Veit Stoss, the laughing angel, allegorical figures of the Synagogue and more. The cathedral is a peaceful getaway exhibiting a spectacular view of the city from the hill. Guided tours are available to the cathedral. Guided tour timings: 10 am – 2 pm. The Cathedral is closed every Saturday from May to October from 11.45 am to 12.45 pm for the organ concerts. Visitors are not allowed during services. The historical museum is just a walk away. How popular is Bamberg Cathedral? People normally club together Alte Hofhaltung and Rose Garden At The New Residenz while planning their visit to Bamberg Cathedral.